The location of the St. Lucie nuclear power plant provides an opportunity to understand the nesting biology of sea turtles. The plant’s location on Hutchinson Island is adjacent to nesting beaches that are among the most important for sea turtle nesting in the western hemisphere. This area is also especially important as the loggerhead and green turtle are currently listed as a threatened species and leatherback turtles are currently listed as endangered species. These beaches on Hutchinson Island are part of an index nesting program (INBS) and a statewide nesting program (SNBS) for Florida. Each morning from March through October, IRG biologists conduct daily nesting surveys on 15km of this beach. 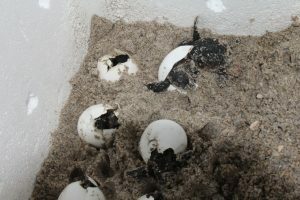 During these surveys, the biologists count the number of loggerhead, green, and leatherback nests deposited on the beach the night before, as well as count the number of “false crawls”, which is when a sea turtle emerges from the ocean but returns to the water without actually laying a nest. In 2015, we recorded 3,748 loggerhead nests, 381 green turtle nests, and 86 leatherback nests on our beaches. This was the highest number of recorded green turtle nests in our history. In 2016, 4,426 loggerhead nests were recorded as well as 101 green turtle and 72 leatherback nests. This was the highest recorded number of loggerhead green turtle nests we have ever recorded. The biologists also mark a subset of these nests and later inventory them to record hatching and emergence success. These data are then provided to the state. The combined efforts of the SNBS and INBS programs not only allow for the management and evaluation of coastal development efforts, but also promote the recovery of marine turtles.